Supermicro's New Generation X9 Serverboards offer the highest levels of performance, efficiency and scalability in the industry. 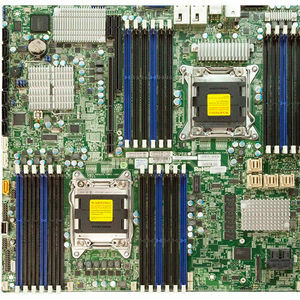 The Supermicro X9 Serverboards are available in a variety of architectures including Twin and new Fat Twin, GPU Supercomputer, Data Center Optimized, SuperServer® Advantage, I/O Optimized, SuperWorkstation, and SuperStorage Solutions. These Serverboards offers numerous advantages including up to 1.5TB DDR3 (up to 1866MHz) memory in 24 DIMM slots, SATA 3.0 and SAS 3.0 (12Gbps) HDD support, ConnectX FDR/QDR InfiniBand ports, dual 10 Gigabit Ethernet, Quad Ethernet LAN, PCI-E 3.0 technology, LSI® 2308 controller with software RAID and LSI® 2208 controller with hardware RAID, IPMI 2.0, and Intel® Xeon® processor E5-2600 or E5-2600 v2 family for highest performance. With this New Generation X9 Serverboard Platform Supermicro offers the most extensive selection of solutions for Data Center, Enterprise IT, Cloud Computing, Graphics, Technical Computing, and HPC environments.